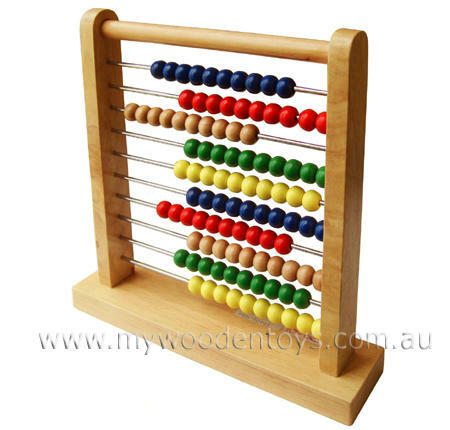 Wooden Abacus is a beautiful, traditional, educational toy. This is a solid well made toy with a heavy base which is smooth to the touch and made to last. With 10 beads in a row and ten rows the counting possibilities are endless. Each row is suspended on metal rods which are well secured into the wooden frame. Red, yellow, green, natural and blue beads run smoothly and make a pleasing click as they touch each other. This is a beautifully simple strong example of a very old accounting system and a wonderful way to introduce your little one to addition, subtraction and multiplication. Material: Wood, Metal and child safe varnish and paint. We like this because: "Well finished, strong, simple. A great example of a traditional toy."